Welcome to the Creations by AR Design Team Blog Hop! This month the Creations by AR Team is sharing creations made with the new House Box and Ornament Template. The template is available for use with Cutting Machines and also as a PDF file for those who do not yet own machines. Continue reading below to see how you can win this new template - there will be THREE Random Winners! I used the Silhouette Cameo to cut my pieces from the 6" x 6" Rejoice Bo Bunny Paper Pad Collection, Chocolate and Cherry card stock. One of the benefits of working with an Electronic Cutting machine is the ability to resize your templates. I have more 6" x 6" papers than I do 12" x 12", so I scaled all pieces 80% in order to fit the house template on the beautiful Bo Bunny pattern paper. Once the template was scaled, I rotated the panel, so that when cut/scored the numbers would be going in the direction. All edges are sponged with Ranger Gathered Twigs Distress Ink. The roof was cut from Chocolate card stock, embossed with a Sizzix folder for texture, then I adhered Mica Flakes for snow. Before adhering the Chocolate Roof panel, I pieced a hole in the Chimney to add the Ornament hanger. The strip cut from Cherry card stock that wraps around the house was stamped with the Woodgrain BG stamp from Our Daily Bread Designs, then I used Fineliner from STAEDTLER to draw in the Faux Wood boards. To accent the windows, I broke apart the template so just the 4 boxes were left on my Cutting Mat, then drew a box around them, grouped them image and sent it to my Silhouette to cut. They were glued in place on both sides. To embellish the Ornament Hanger, I tied Basque Red Vintage Seam Binding into a Double Bow using Becca's Peg Bow Maker. Besides filling these with treats, you could also add a battery operated Tea Light. To participate and be eligible to win, simply leave a comment on each designers blog hop post by Sunday, November 18th Midnight EST. One Winner will be selected from comments left on the Designers Blogs, One from comments left on the Creations by AR PCP Group, and One from comments left on the Creations by AR FB Page. Winners will be announced November 19th on the Creations by AR PCP Group and Facebook Page. 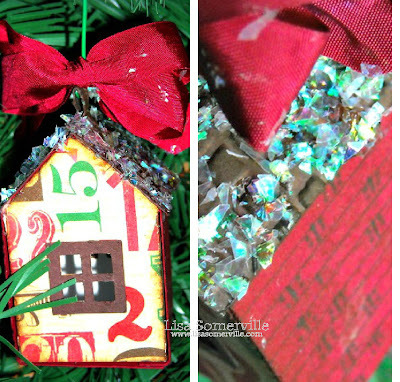 I am loving the ideas I am getting for these cute little houses! Thanks! The Mica Flakes are gorgeous ... like icicles in Narnia! I too like the mica flakes, really makes it seem so festive. Love your sparkly roof and big red bow Lisa! This looks so pretty on your tree!! Love the addition of the bow to the top! Very cute--I like the papers you used and the mica flakes for snow. So cute !!! love the idea of putting a battery tea light inside! The bright colors and flakey snow make me think of a gingerbread house. Lovely! I love advent calendar type things and the paper you used made me think these would be great all over the tree in different papers for each day. I love the way you decorate your little house! super cute house and love the mica chips on the roof. Just so cute, and love the glittery effect on the roof. This is so cute. I love how you did the roof. Wow! I really like this tree decoration. Way cool! Enjoyed reading your description Lisa...love all the fun details-and the fact that you used 6x6 papers! So fun and festive! Lisa, I love the mica flakes you added to the the roof! I wish I had thought of that when I was trying to look for fake snow. Love your work as always! Lisa, I love the way your cute little house is hiding amongst the branches. The snow with the mica flakes looks great. How clever of you to use mica flakes for the roof top to give it the look of snow. Thanks for the reminder that we can change the size of the templates-what a great added feature of using Adela's templates! Muy linda con colores navideños, y me gusta lo que le colocaste en el techo le da brillo. Adorable Christmas house! I love the snowfall on the roof!